Our Origin: Around a campfire in the summer of 2004 five fossil hunters discussed how they might contribute to science as they pursued their passion. This core crew collaborated to develop the North America Research Group. Since our inception, and in a very short period of time, NARG has grown into a diverse and dynamic group of men and women sharing a mutual respect and passion for geoscientific study and fossil collecting. Our international membership of over a hundred ranges from 10 to 80+ years in age. This adventurous consortium of individuals has an amazing variety of backgrounds, interests, hobbies, educations, and professions; including biology, oceanography, paleontology, paleobotany, and geology. NARG sponsors the NW Fossil Fest and participates in many programs and shows devoted to public education. We collaborate with university scientists and museums to enhance and promote research. Significant specimens are donated to recognized museums to insure they remain in the scientific and public domain. We believe that research and boots-on-the-ground exploration will locate the next great specimen in our region. Join us in search of the next new species. They are out there! During 2012, NARG member Gloria Carr discovered vertebrate bones on private land near the crossroads of Suplee, Oregon. What she found was a Jurassic sea monster (what was thought to be an Icthyosaur). The creature, named Bernie in memory of the land owner, was then recovered (with permission and road permits from the County) by NARG. Volunteers, led primarily by Greg Carr, prepared some of the bones (including a skull) at the Oregon Museum of Science and Industry (OMSI) in Portland. The first analysis of the prepped bones will be performed at the University of Alaska. The specimen will eventually be part of the Condon Collection at U of O and researched and used for education by NARG. During 2011, NARG member Bob Manley discovered this vertebrate on private land in an Oligocene formation. Research was performed at University of Oregon to determine the likelihood of a new species of salamander or lizard. The results reveal that although it was not a new species of salamander, it is the first identified to occur in the Lyons Formation. During 2010 and early 2011, a number of cone fossils have been recovered by NARG members from the Astoria Formation near Newport, Oregon. These are somewhat rare considering the sediment is entirely marine. The most recent specimen (pictured left) was found in February 2012. Research is currently underway at Oregon State University by professional paleobotanists to determine if this may be a new species of conifer. July 2009 NARG Campout – While exploring a Keasey formation talus slope in the Nehalem drainage, intrepid 5th year member Steve Hetrick (The Virginian) scored big-time. Splitting siltstone boulders on the slope, he discovered a puzzle. What is this thing? Flora, Fauna? Late October of 2007 found NARG members excavating a late Miocene whale skull rostrum from the Empire Formation near Coos Bay, Oregon. Members have worked during the intervening 5 ½ years to curate, stabilize and de-construct the specimen from shrinking matrix, and to prepare and begin re-construction of the rostrum parts. Upon completion this specimen will be donated to the University of Oregon . 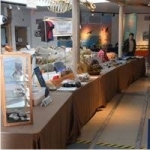 NARG wants to extend it's appreciation to all those that participated, contributed, supported NARG in the whale recovery. "Top 10 Dinosaur and Fossil Finds of 2007"
In early 2008 National Geographic honored NARG by designating Oregon's Jurassic Crocodile the 2nd most significant fossil discovered worldwide in all of 2007. It is both humbling and stimulating to have received this award for our discovery. Well done! to our staff and crew for your efforts! A fossil discovered by amateur paleontologists in Central Oregon is the lower jaw of a plesiosaur, a marine reptile that swam in the ocean that covered most of Oregon 90 to 100 million years ago during the Cretaceous. Plesiosaurs were primarily fish eaters and grew to a length of about 25 feet. The recovered specimen will be housed at the Museum of Geology in South Dakota. The museum staff is currently removing the rock from the fossil to determine the specimen's condition. The BLM is working with local entities to find a more permanent home for a replica for public education purposes.